In April I shared my favorite go-to-bed-drink ‘Tumeric Tea’. And it was lovely to find out some of you actually tried it and sent me messages and pictures. Some of you had to get used to the taste. Most forgot the pepper the first time (it is an odd ingredient) and for some it’s now part of their routine as well. 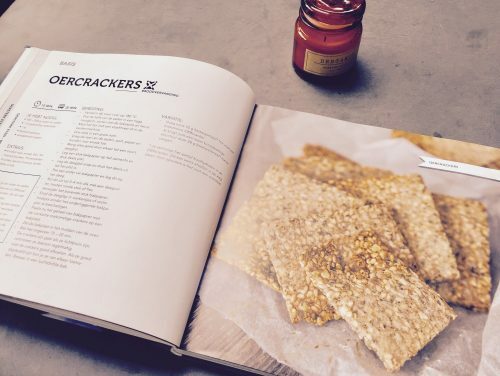 So I like to share another favorite recipe: crunchy nut crackers. I got this recipe from ‘Oersterk’ by Richard de Leth. It is an easy recipe and can be made in 20-25 minutes (10 min preparation, 10-12 min baking). Blend/mix nuts and half of the seeds (I use a blender, but food processor can be used as well). Put the blended nuts/seeds in a bowl, add the rest of the seeds, egg and oil and stir it with a spatula. Add black pepper and salt according to taste, stir again. Flatten the dough between two sheets of parchment paper (Dutch: bakpapier) with a rolling pin. I always try to get the dough as thin as possible. Remove the top sheet of parchment paper, use a knife to slice thin pieces of dough into crackers. Bake the crackers for 10-12 minutes. Let cool completely before eating. You can vary al lot with this recipe. You can for example just work with one type of nuts (peeled almonds) or add additional ingredients like herbs the provence, cayenne, dill, garlic or cinnamon. Be creative and share your experiments with me! These crunchy nut crackers taste delicious, mark my words. And that’s why a warning is necessary, because you might end up eating all the crackers at once, or at least in one day. And that is not a smart thing to do, although it is made of healthy ingredients. Moderation is key with nut crackers. You wouldn’t be able to eat 200 grams of nuts as is. One or two hands would probably be more than enough to get you through the day. So keep that in mind, while eating these crackers.